Together we can make a difference and impact not only today, but tomorrow! An Awe-Inspiring Gift: When you’re sitting in a meeting, you don’t quite expect to be called to the front of the room and presented with the most awesome gift. This happened to me, Alison Banikowski, at a meeting of principals in the Olathe Public Schools. 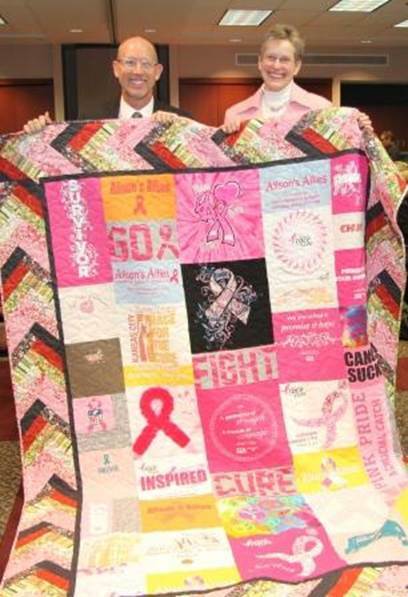 Principals, teachers, and other staff had gotten together to create a quilt with t-shirts from my Komen KC Race for the Cure team called Alison’s Allies, along with Komen KC t-shirts, and other inspiring symbols of the fight to end breast cancer. Dr. B and principal Greg Oborny show off the hand-made quilt presented to Alison at a recent faculty meeting. Another long-time supporter of the Komen Race for the Cure is Dr. Melanie DeMoss, another principal in the district. “I have known Alison to be a champion for many years. As Deputy Superintendent in our district, she has championed causes and made a difference for countless lives of students in the Olathe area. Several years ago, Alison became a champion for even a wider audience as she battled breast cancer. Her tireless commitment and dedication to putting an end to this deadly disease is no surprise to those of us who have respected her for her perseverance for many years. The quilt is a symbol of her passion to end breast cancer forever and the support that she feels surrounds her in her passionate cause”. Jennifer Mullen, a school counselor in the district and a tireless supporter of the Race for the Cure, was instrumental in pulling everyone together to create the memory quilt. Jennifer, who has been touched by breast cancer in her family, says “ For many people who have battled cancer, there is nothing more important post treatment, than getting back to a “normal” life. A life where cancer is moved to the back burner and every effort is made to not think about it. For Dr. B, the most urgent activity post treatment is redirecting her energy from fighting for her life to fighting for others. Instead of putting cancer behind her, she works tirelessly with various organizations to raise thousands of dollars for research and support. She coordinates Alison’s Allies which holds yearly fundraisers and walks in the KC Susan G. Komen Race for the Cure, consistently earning the top individual fund raiser spot. Dr. B. proves that surviving cancer is much more than getting through treatments. Surviving cancer is being a part of “one community and one vision, to end breast cancer”. Alison Banikowski was one of Komen Kansas City’s 20 Faces of Komen in honor of their 20th Anniversary in 2013. This was a speechless moment for me! The quilt will be a treasured memento for years to come. The tribute has inspired me to continue fund-raising through the Susan G. Komen Kansas City Race for the Cure. Together we can make a difference and impact not only today, but tomorrow. A world without breast cancer can be a reality! Do you have a breast cancer story that you would like to share with tens of thousands of breast cancer fighters? Please email Michael A. Levine, Komen Kansas City Communications Manager, at mlevine@komenkansascity.org to be considered for a future blog post on Behind the Ribbon. Every1 Counts for KC | 21 years of homegrown support! makes this possible? Well, simply put, everyone. Every survivor. Every supporter. born – that it’s the ones that help make us whole. Every1 Counts for KC. Tell us your Every1 Counts for KC story at www.Every1KC.org. Komen Kansas City is pleased to be able to provide a vehicle to deliver a “Digital High-5” recognizing someone who has made an impact on them: survivors, co-survivors, friends, family, co-workers, etc. Go to the site and fill out the short form with your information and a brief story. Feel free to share your post on Facebook & Twitter too! 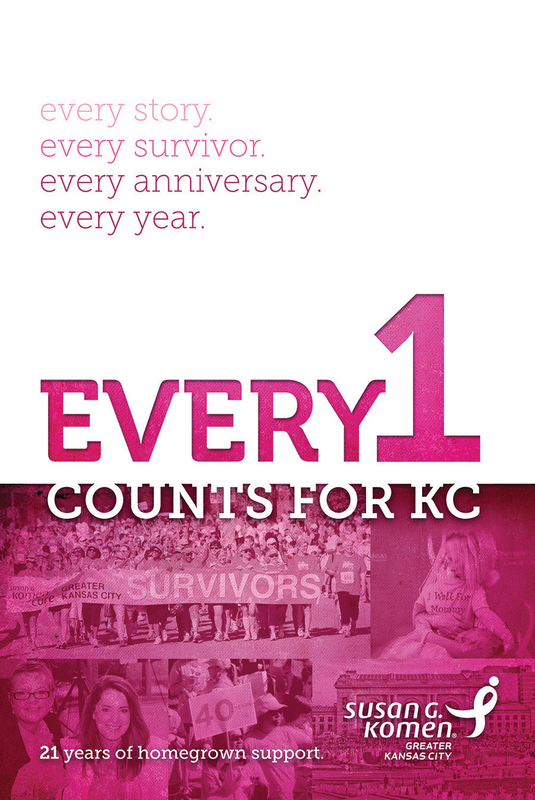 Follow #Every1KC story on the many Komen KC social channels: Facebook, Twitter & Instagram. A special thank you to the fine folks at MBB (Muller Bressler Brown) for their work on the campaign and the Website.